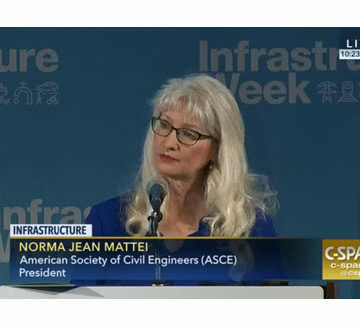 ASCE President Norma Jean Mattei spoke at the Infrastructure Week kickoff event, May 15, in Washington, DC. Nothing, it seems, is uniting the country these days quite like the shared enthusiasm for infrastructure investment. A new U.S. Chamber of Commerce poll found that 73 percent of Americans want the federal government to take the lead on rebuilding the nation’s transportation infrastructure. 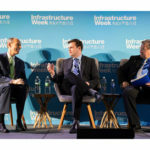 Thus the spirit of Infrastructure Week 2017 was an unusual blend of equal parts urgency and optimism, reflected in a “Time to Build America” event at the Chamber of Commerce in Washington, DC, that kicked off the week. Infrastructure Week is an annual rallying cry, using different events, educational programs, and advocacy efforts to spotlight the critical need for U.S. infrastructure improvements. ASCE served on the 2017 Steering Committee, and Society President Norma Jean Mattei, Ph.D., P.E., F.SEI, F.ASCE, was among an impressive lineup of speakers at the kickoff, headlined by Secretary of Transportation Elaine Chao. 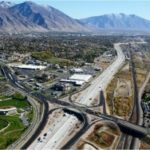 “If the United States is truly committed to an infrastructure system that is built for the 21st century, we need increased and sustained investment; we need bold leadership; we need thoughtful planning; and we need careful preparation – not just for now but for the future, so that infrastructure is both sustainable and resilient,” Mattei said in laying out the key results and solutions from ASCE’s 2017 Infrastructure Report Card. 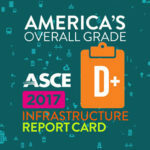 While Mattei’s presentation of the Report Card sounded an alarm for the country’s infrastructure crisis, the pledge President Trump has made to invest $1 trillion in public works lent the event a sense of cautious optimism. “How many times have we gathered to talk about infrastructure needs? How many Infrastructure Weeks have we celebrated together? Now’s the time. This is absolutely our moment to make progress on this issue,” said Jay Timmons, president and CEO of the National Association of Manufacturers. “We have a president who likes to build things. He understands the importance of infrastructure investment.” The questions are when and how. In her remarks, Chao indicated that an infrastructure plan is in the works, with an interagency task force now at work on a proposal. “The administration will share its vision of what the infrastructure plan will look like in the next several weeks, which will kick off our collaboration with Congress,” Chao said. Follow Infrastructure Week events on social media @InfraWeek. 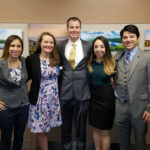 Locally oriented activities included ASCE Michigan Section’s Michigan Infrastructure Conference on Thursday, May 18, while Region 9 conducted its annual California Legislative Day. Learn more about Infrastructure Week 2017. Give to the ASCE Foundation Infrastructure Fund to help meet 21st century needs. Donate at www.ascefoundation.org/give.